Hello, my name is Todd Baker, toddbaker@orgmarketing.com and you must be interested in nonprofit fundraising online. This blog book is a step-by-step process that will help you in your quest. 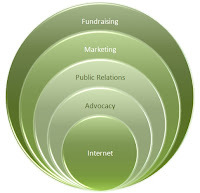 What you are about to read is unique because it gives you an understanding of the nonprofit fundraising online experience from the charity and constituent perspective simultaneously. Good marketers know what works but great ones understand why things work. You will not find any quotes from 14th Century philosophers, poets or playwrights. Nor will you have to read ramblings on about the industrial age, Civil War History and/or the next big wave in direct marketing and advertising. This blog book is not going to provide a chronological order of how the Internet began or enamored speak about how quickly people are signing on board. There are no fancy-schmancy metaphors relating the Internet with anything that comes out of a spider. Nope, none of that, just straight to the point advice to help you quickly master the online world. Frankly, we don’t have much time to get our collective nonprofit houses in order as it relates to the Internet. For it is my belief, the Internet will become centric to all of your marketing. For one simple reason, you can never stop someone from going to your organization’s Web site. If you produce a lousy radio advertisement the good news is that most people you are wanting to reach didn’t hear it or if they did, won’t recall it weeks later. However, you get one shot with your Web site and it only takes seconds to make an impression . . . good or bad. It is my hope you can implement these steps tomorrow so that people who are searching for meaning in life may find your wonderful organization and become fulfilled thus our world will be better for it. Hi Todd - I don't remember how my surfing landed at your site and don't know why I haven't found you before, but I'm very glad I did. Our Org needs bunches of help and I like your to-the-point writing style. Write on!